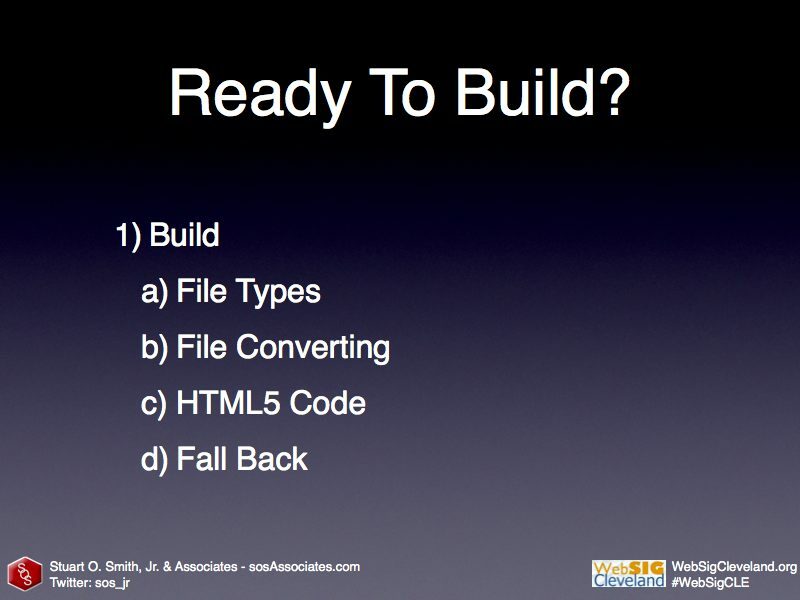 The following slides, HTML samples, and text were originally created for my oral presentation. 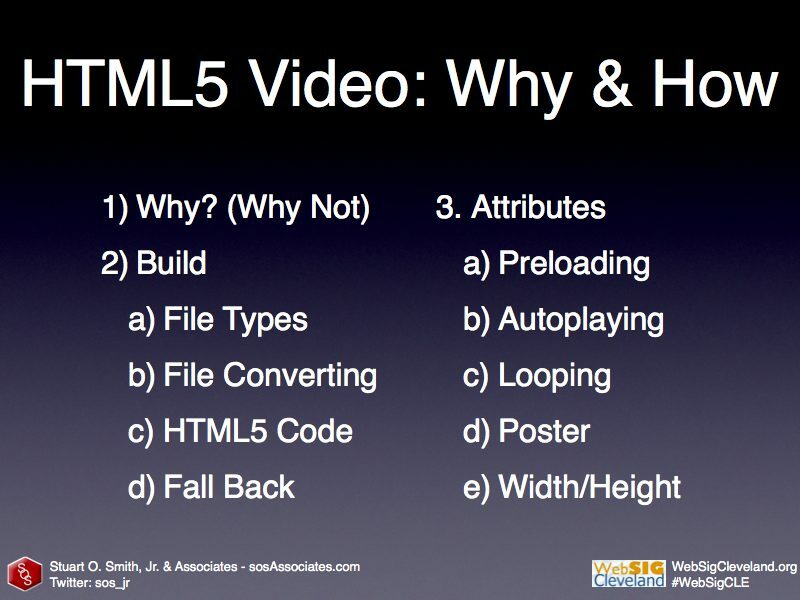 I hope that they, along with the links for additional resources, assist you in experimenting with HTML5 video on your own website. Please feel free to contact me via Twitter at sos_jr or to attend a WebSigCleveland.org meeting if you need additional information. 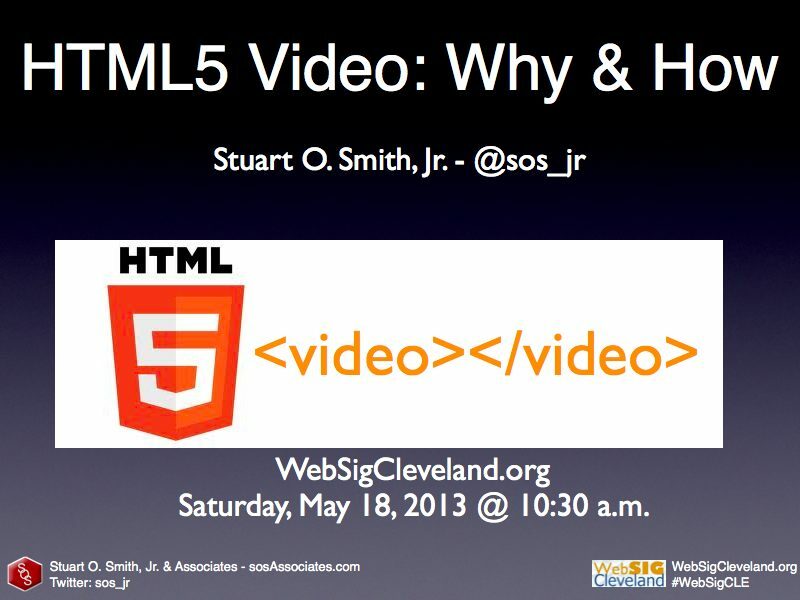 I wanted to write this HTML5 Video post this week as the fall season of WebSigCleveland.org starts this Saturday! Please visit the website, and mark your calendars for the upcoming meetings. Also this Saturday is Ingenuity Cleveland (@Ingenuityfest) -- the sample videos below are from one of their previous events. 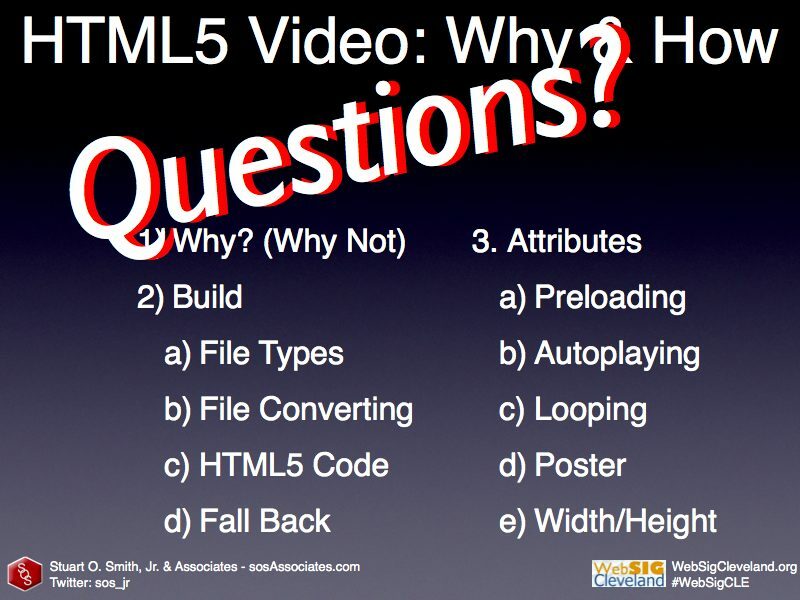 Saturday, May 18, 2013 at 10:30 a.m.
Why use HTML5? Pros and Cons. Where you should use it – types of projects. 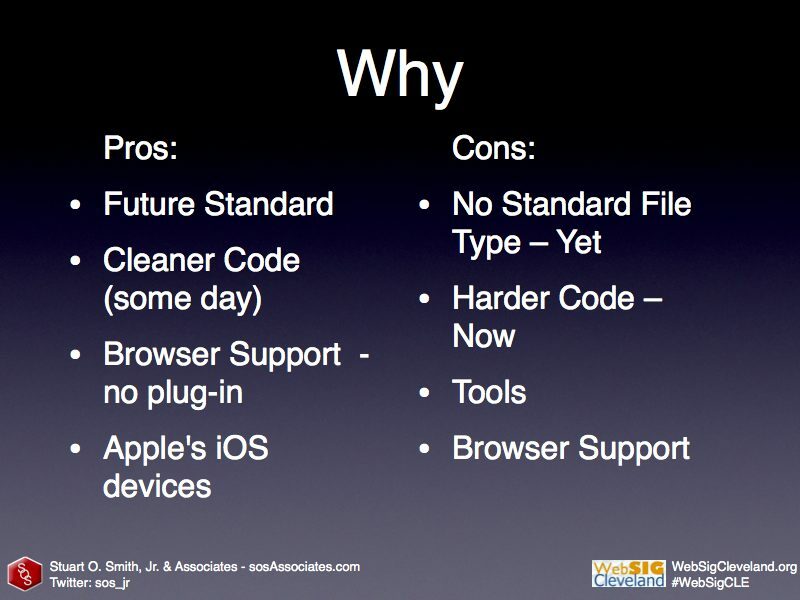 Future Standard - In the future will be easy to use and have cleaner code. Doesn't require plug-in. Built into browser so better performance. Mobile devices fastest growing segment. The following are some links to resources I found. 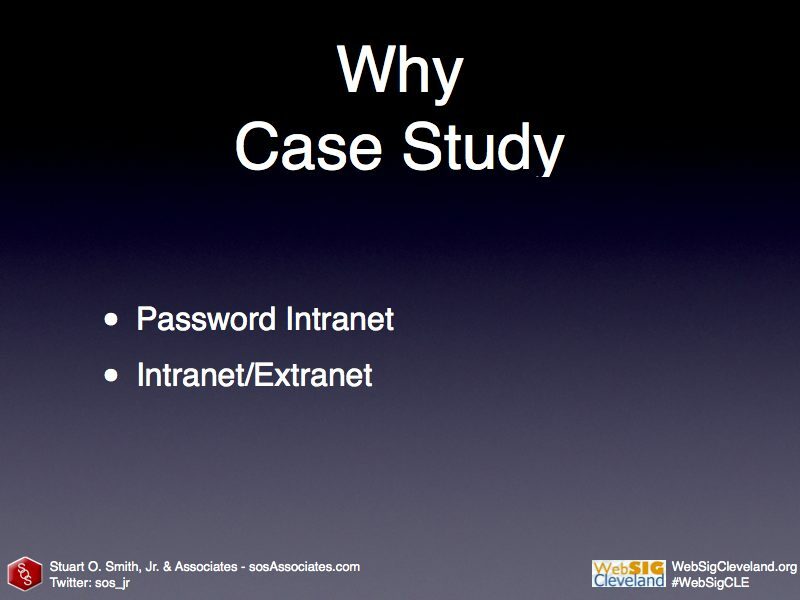 What % of website visitors use iPhone/iPad? We are not here yet. 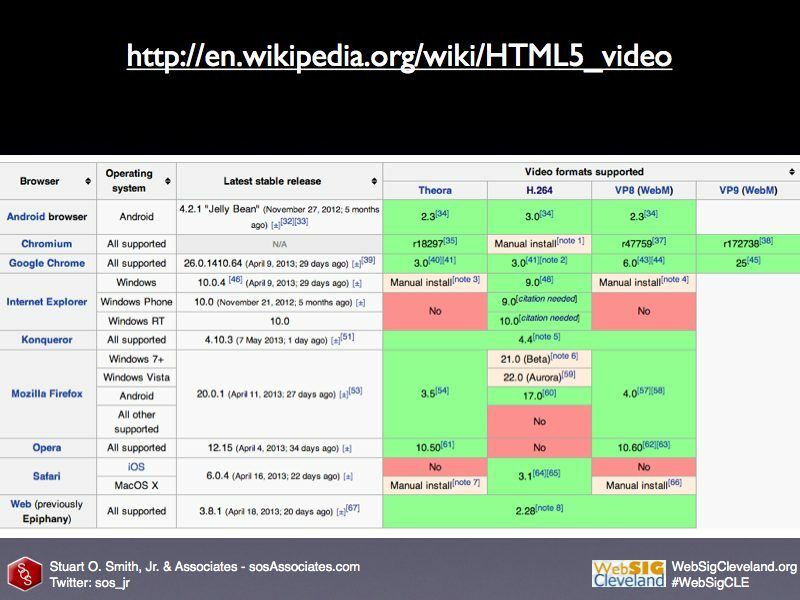 Currently there is no HTML5 Video standard!!! 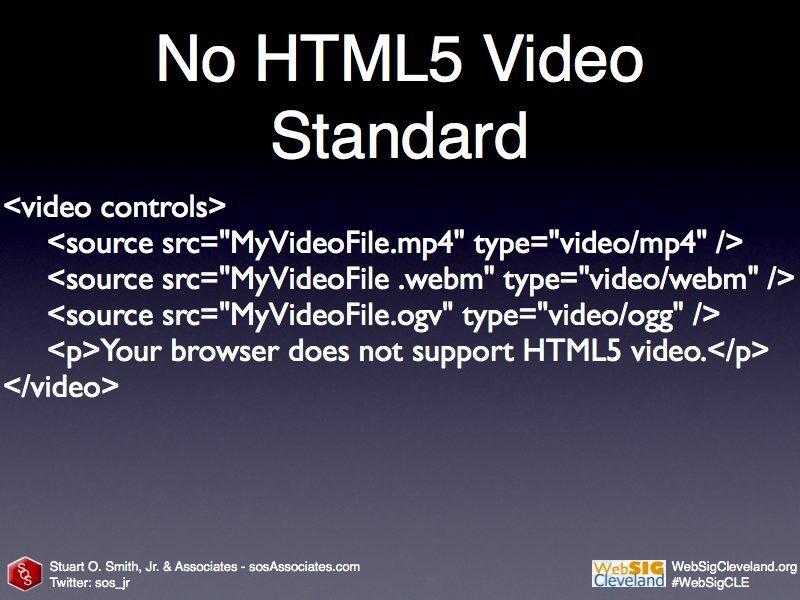 Unhappy that there is no HTML5 video standard. Also, unhappy that I still need to use Adobe Flash for some browsers. Today, most projects should just use Youtube.com. able to support both Adobe Flash or HTML5. It provides the correct type of video depending on the device you are using. YouTube is currently the second largest search engine after Google. Over 800 million unique users visit YouTube each month, while over four billion hours of video are being watched each month. 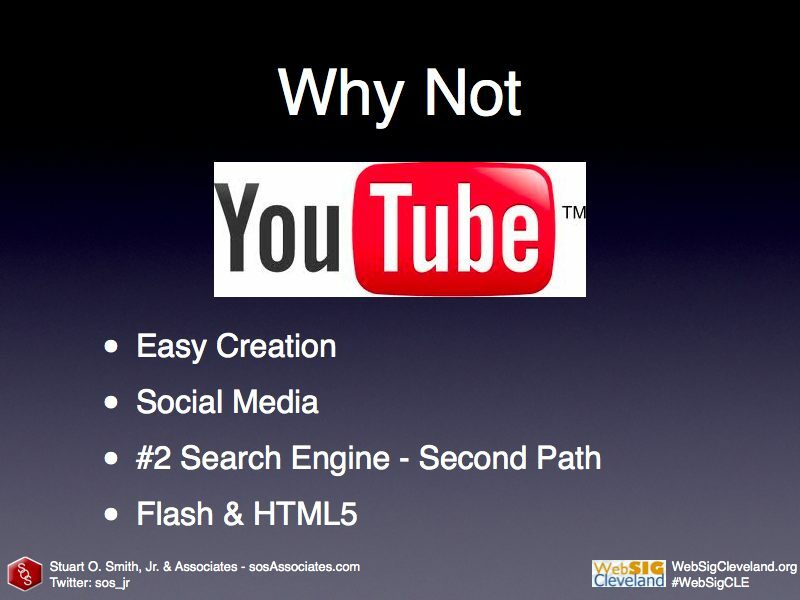 YouTube.com is very easy to use and it is a great way to have people find your website. Here is an article on YouTube.com on adding videos and playlists to a website or blog by embedding them. Here is an example of a YouTube.com video that I used in my May 5, 2013, Bal Ingénieux, Ingenuity Cleveland blog post. 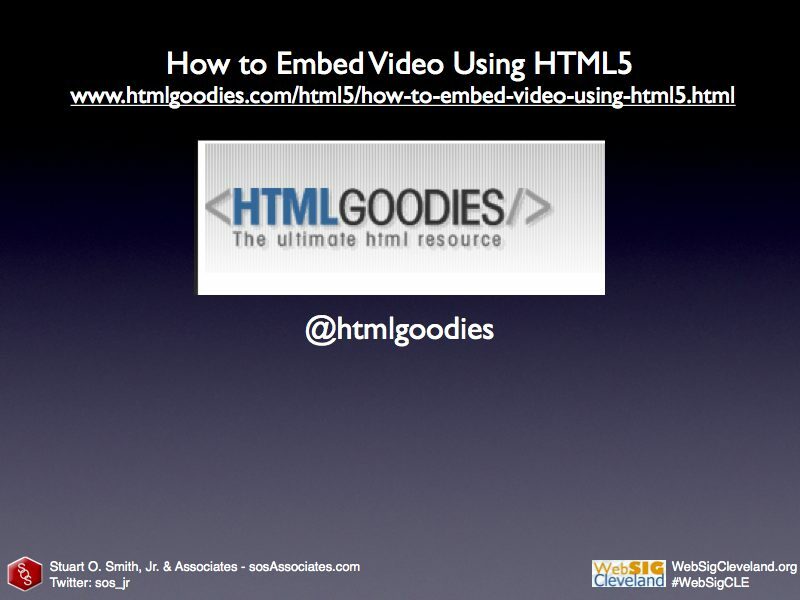 Below, you will see HTML5 Video samples from my presentation of the same video that I created using three video types. 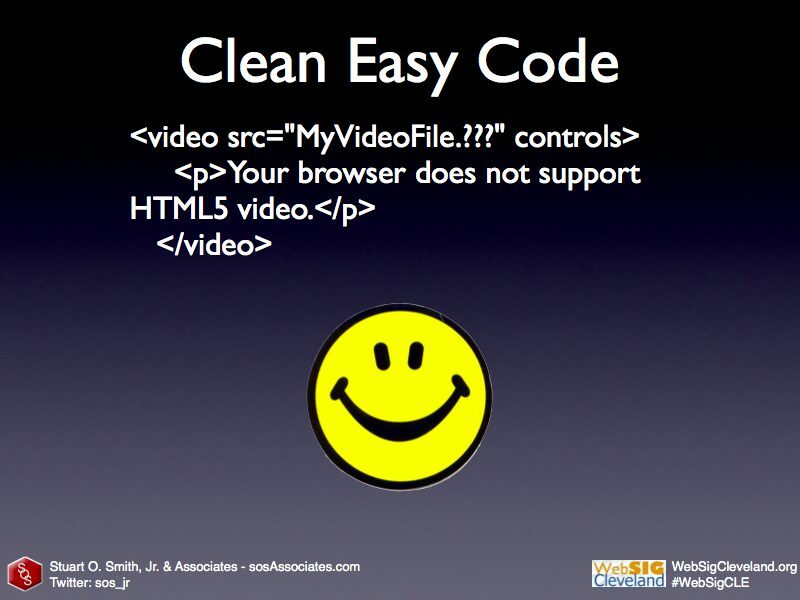 Today you might choose to use HTML5 video for websites in password-protected sections of your website. If you have a video that you don't want YouTube.com search to have control of, then use HTML5 video to host your own videos. 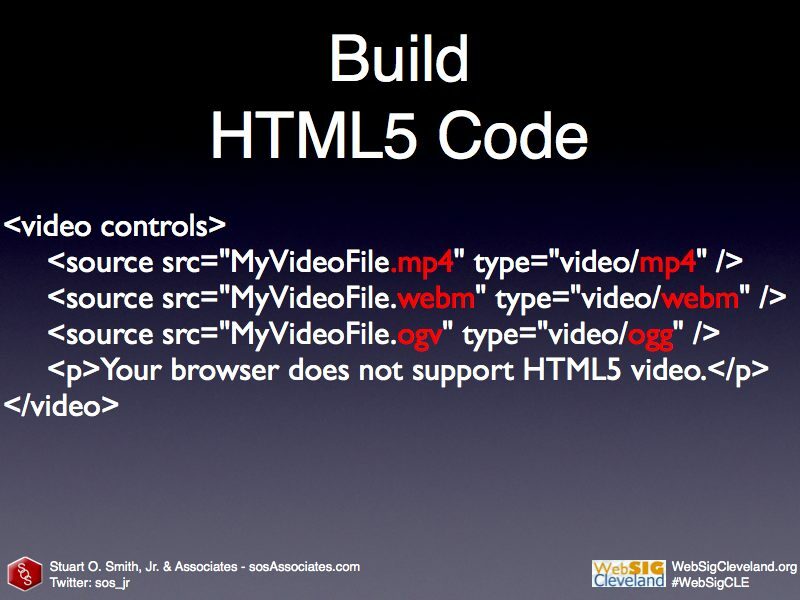 Let's build some HTML5 video. Here are the steps . . . 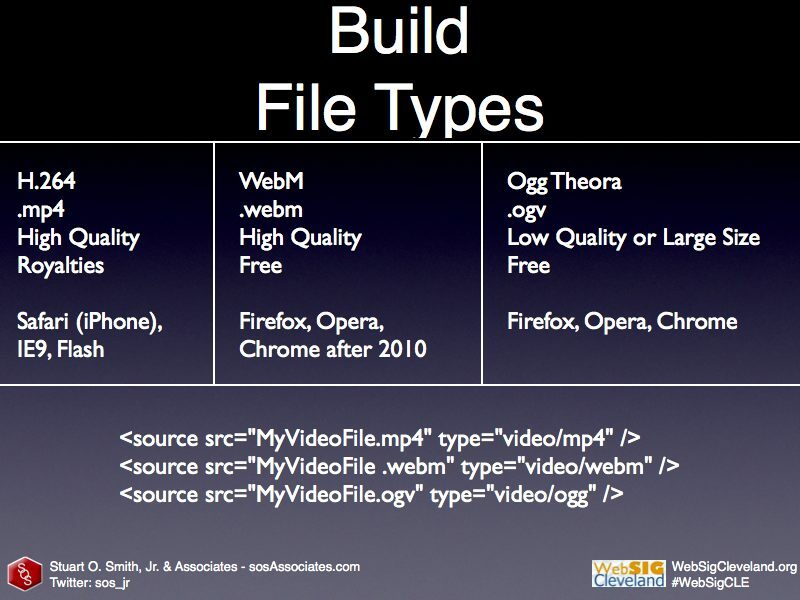 File types and the order in which they should be used. 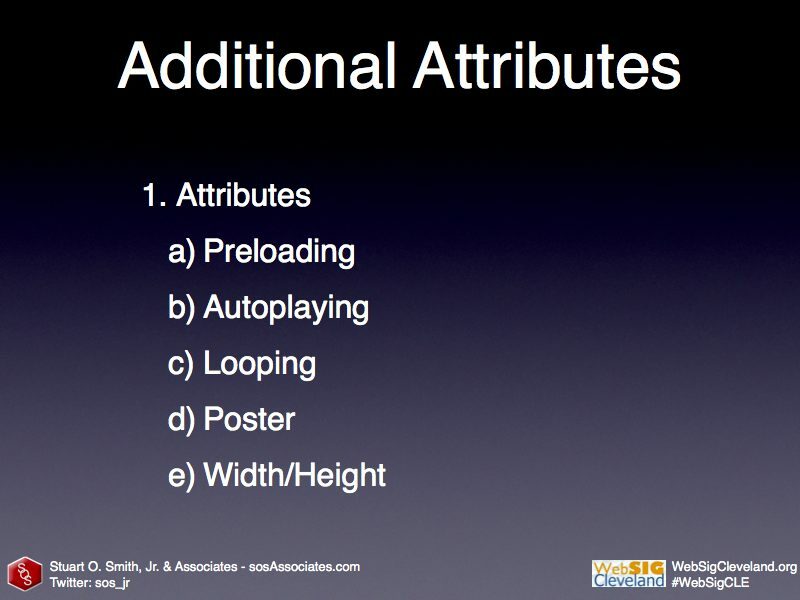 During the WebSigCleveland.org meeting, I reviewed the different features of each file type and explained why this order is important. Now, we want the mp4 source above the ogg source. We want that first because of a bug in the iPad. The iPad will actually hit the first source and if it can't play that, it will just stop. Now the reason I'm putting webm above the ogg source is because the webm is a higher-quality format and is supported by the same browsers as ogg but not supported by as many browsers or as many browser versions as ogg. Incredible that all these resources are free! I love the web development community! Code samples for HTML5 video. I had my son, Kevin, take the original video I took at the Bal Ingénieux, Ingenuity Cleveland​ event, and add titles within the video with the three names of the file types used in HTML5. He then created the three files you see used in the samples below. The first sample has all three files, so whichever file type your browser supports will be used. The title that my son added will show you the file type being played. The rest of the samples only have one file type each being used, so you will be able to test which files your browsers support. Over time, I expect that what the browsers support will change. With each sample file are some notes about the file type. The HTML used to display them is shown after each sample. 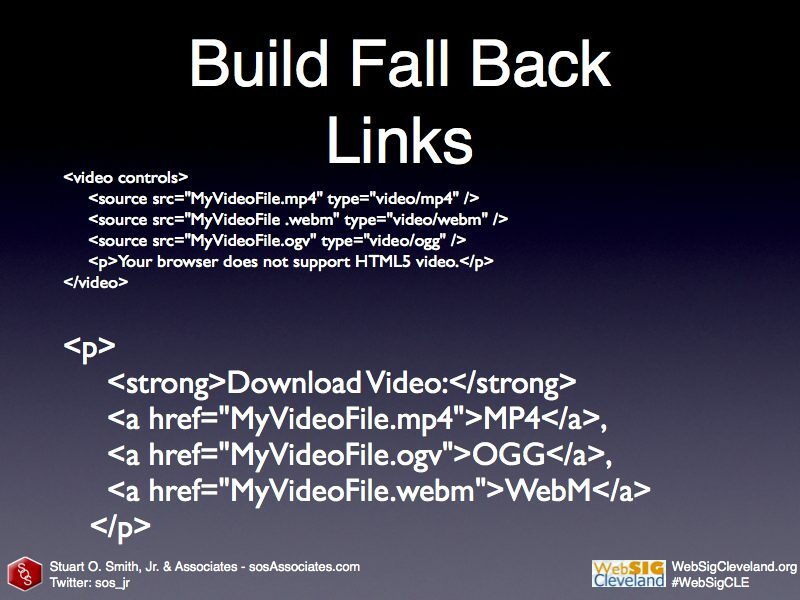 Fall-back options are for browsers that do not support HTML5 video. Note: Internet Explorer 8 and earlier versions do not support the <video> tag. 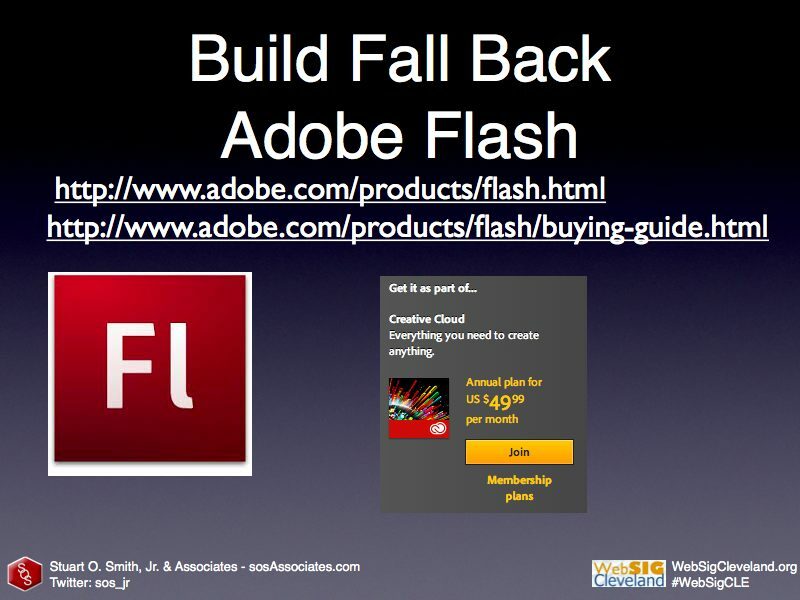 Adobe Flash is supported by 95 to 99% of the browsers used by visitors to your website. It is expensive! 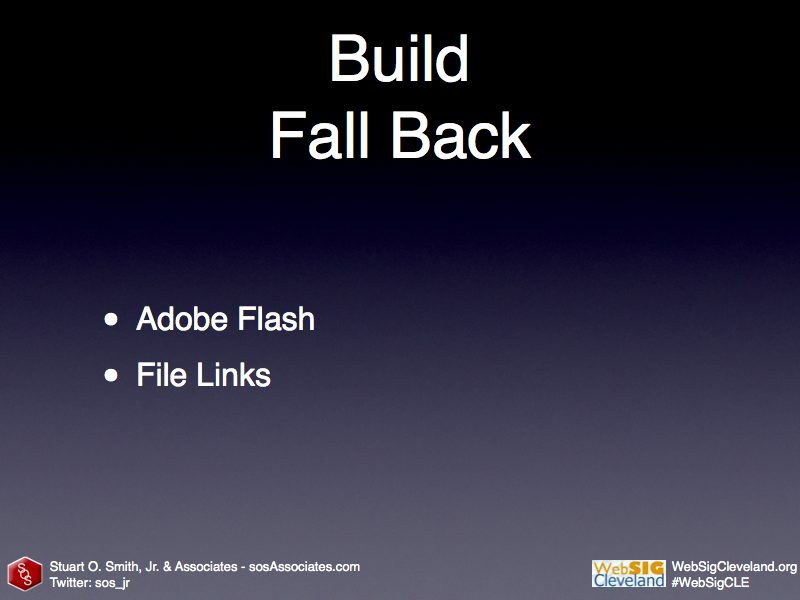 Different fall-back options include Flash, Silverlight, QuickTime, and Java. 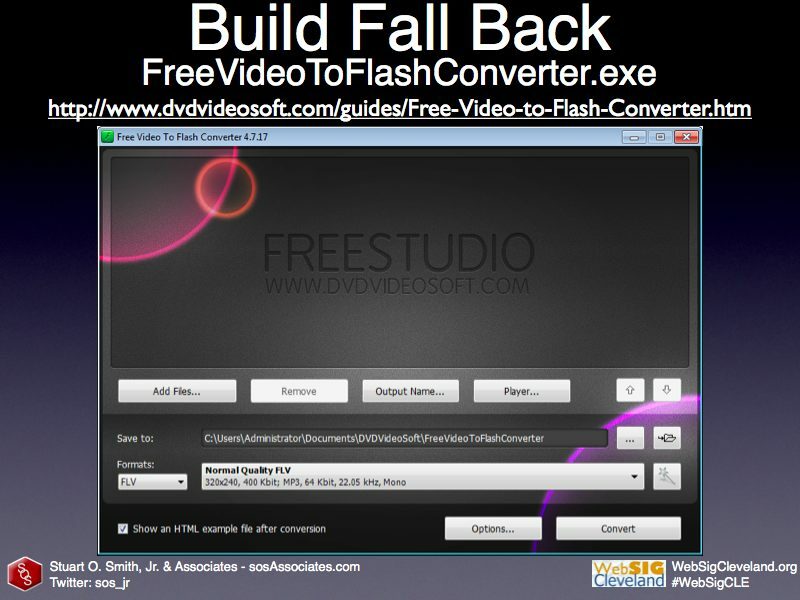 I recommend Flash because it is the most widely supported and most widely used plugin for web video. 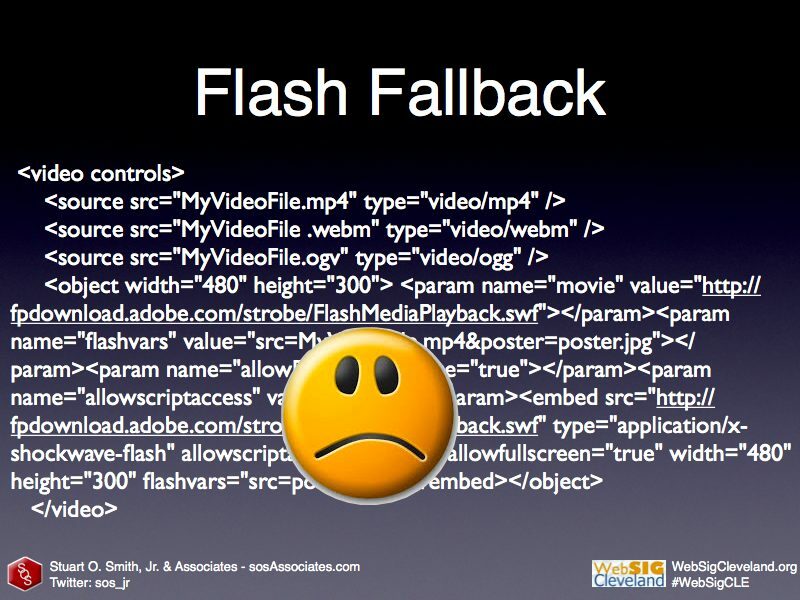 Therefore, what we need is a Flash Player embed code. 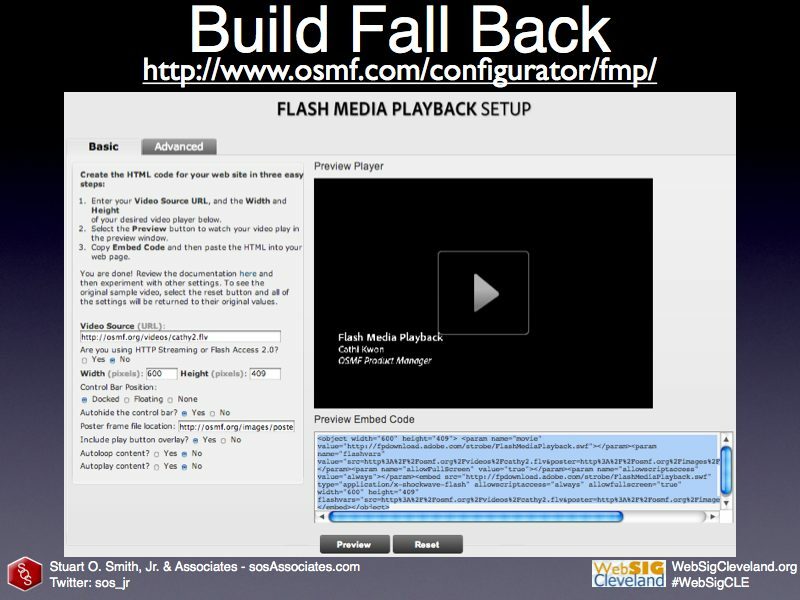 Flash Media Playback Player is a free and hosted Flash video player by Adobe that is easy to configure. I don't recommend it, however, since it is dependent on Adobe's hosting of the Flash Player. I prefer to host my own Flash files. 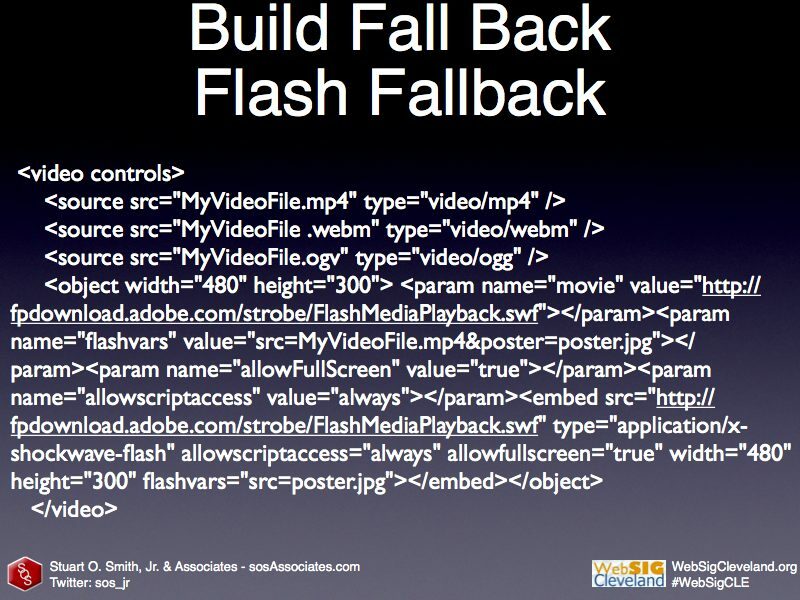 The above slide shows what the code for a Flash fall-back option can look like. Someday when HTML5 is fully supported, we will not need to deal with this mess. 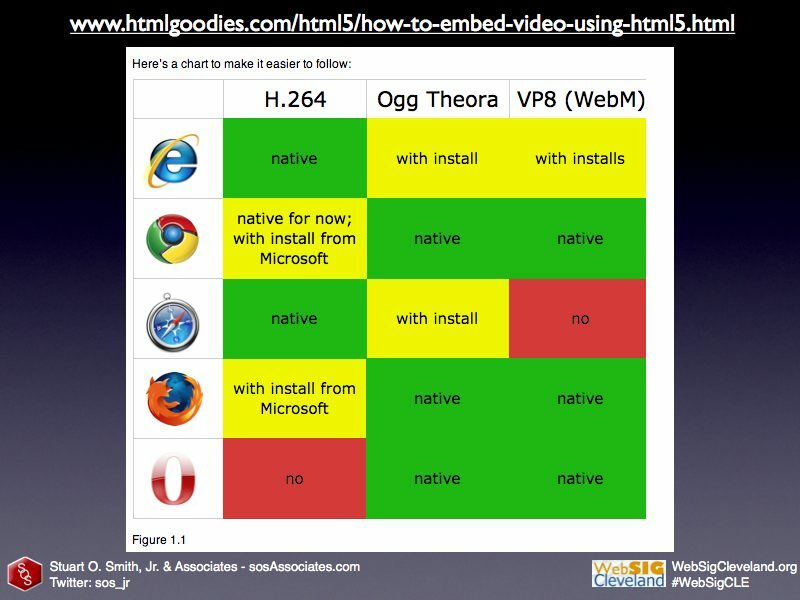 One option with HTML5 video is preloading. Preloading means the browser will begin loading the video as soon as the page is opened. Without preloading, the user might have to wait for the video to load when they click play. A downside of preloading is that the video is loaded every time the page is viewed, even if the user never watches the video. Preload has three possible values: none, auto, and metadata. Preload “none” tells the browser to load nothing. It will not even show the size and first frame of the video. Preload “auto” loads the entire video. Only use this if you are not concerned about bandwidth with this particular video. You are taking away your user's control of the video, and forcing them to load the video file. Apple IOS devices do not support "preload auto" for their users because their users are on mobile connections where bandwidth could be expensive. Preload “metadata” looks the same as "auto," since it loads the first frame and the metadata. It's basically telling the browser to load the metadata of the video which includes information like the video frame size, duration, and the first frame, but not the rest of the video. Currently only Firefox version 4 supports metadata. 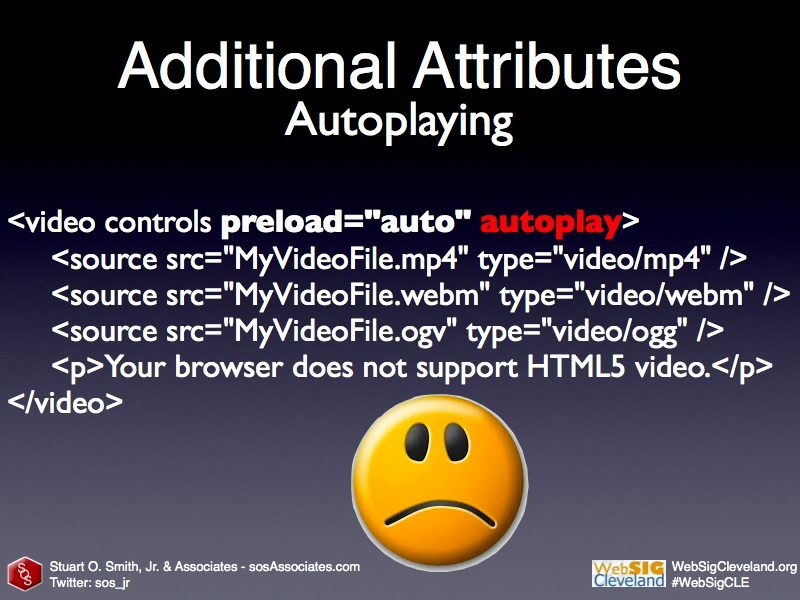 Another option is to autoplay the video, which means it will play automatically once the page opens, without any interaction from the user. I do not recommend using this, since it can annoy visitors to your website. 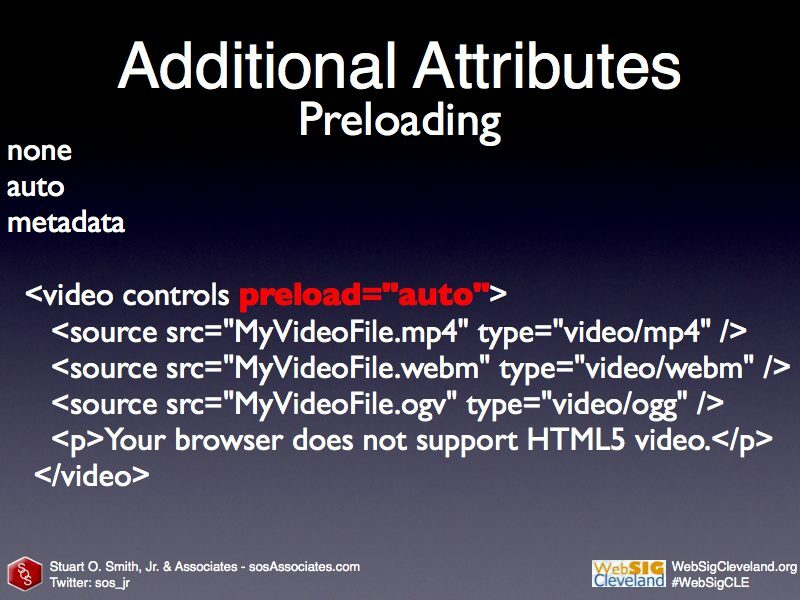 Note how it works with preload="auto"
Autoplay, like preload, is disabled on iOS devices like the iPhone. This goes along with Apple's decision to protect their user's bandwidth, since mobile bandwidth can be expensive. Firefox does not yet support loop, but will someday. All other HTML5 browsers do support loop. 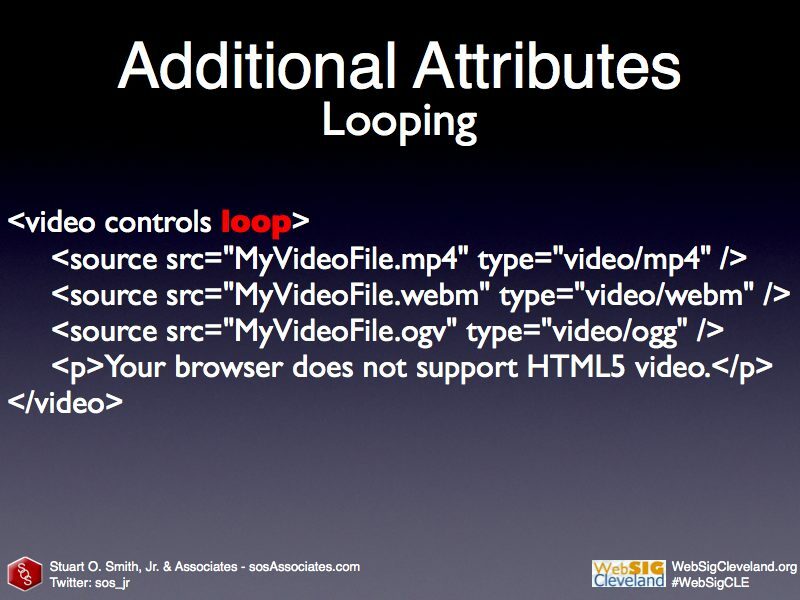 The loop attribute specifies that the video will start over again, every time it is finished. Poster is the image that shows in the place of the video before the video has started. With the poster image, I can choose a specific image that best represents the video. The image functions as a placeholder for the video. The image can be either a GIF, JPEG, or PNG. 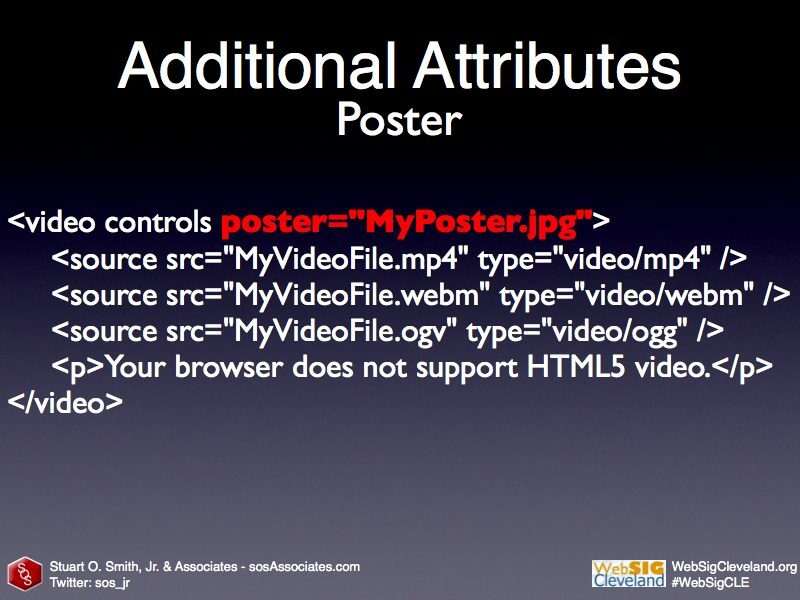 For the most part, browsers support the poster attribute pretty consistently. There is an issue with Safari where if you preload the video, Safari will show the first frame of the video as soon as it's available. Poster is a recommended attribute. 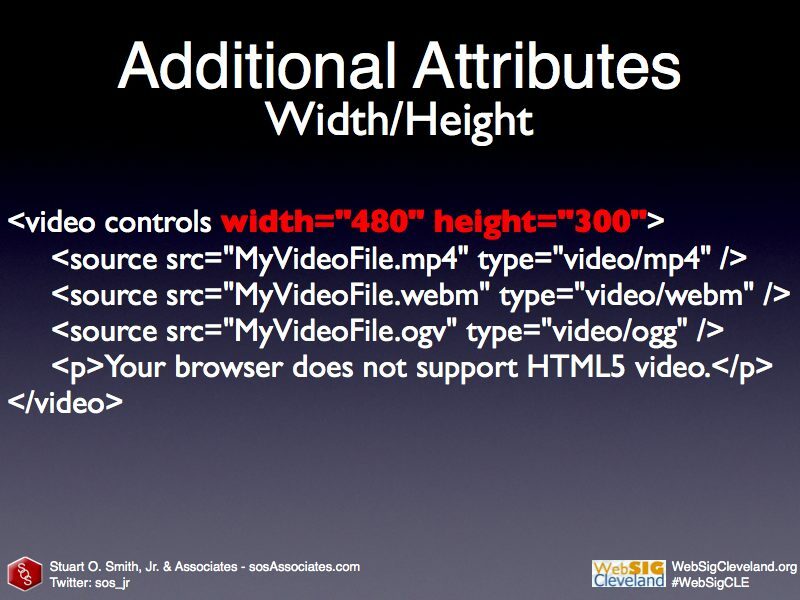 Use width/height setting to make the video area the same width and height as the video itself. Feel free to come to a WebSigCleveland.org meeting with your questions. All meeting are free and open to all! I use Miro Video Converter to make MP4, WebM, Ogg Theora files for HTML5 videos for a family holiday website for 2015. Of all the tools mentioned in this blog post, Miro Video Converter is the one I am still using today.